This article describes how map making has played an important role in the development of mathematics. It is hardly surprising that cartography should be considered as a mathematical discipline in early times since cartography measures positions of places (mathematics was the science of measurement) and represents a the surface of a sphere on a two dimensional map. Of course what constitutes a map is hard to say, especially when one goes back to the very earliest times. 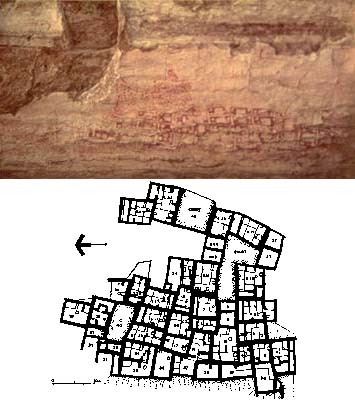 In around 6200 BC in Catal Hyük in Anatolia a wall painting was made depicting the positions of the streets and houses of the town together with surrounding features such as the volcano close to the town. The wall painting was discovered in 1963 near the modern Ankara in Turkey. Whether it is a map or a stylised painting is a matter of debate. Early attempts at maps were severely limited by lack of knowledge of anything other than very local features. In Egypt geometry was used from very early times to help measure land. The annual flooding by the Nile meant that without such measurements it was impossible to reconstruct the boundaries that had existed before the flood. Such measurements, however, seem only to have been of local use and there is no evidence that the Egyptians integrated the measurements into maps of large areas. The oldest extant example of a local Egyptian map is the Turin papyrus which dates from around 1300 BC. Early world maps reflect the religious beliefs of the form of the world. 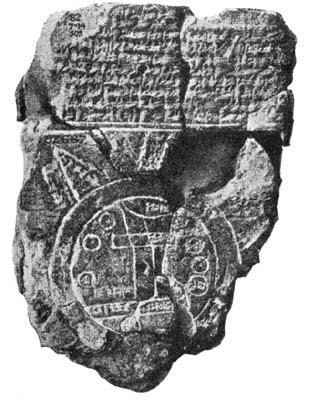 For example maps have been discovered on Babylonian clay tablets dating from around 600 BC. One such map shows Babylon and the surrounding area in a stylised form with Babylon represented by a rectangle and the Euphrates river by vertical lines. The area shown is depicted as circular surrounded by water which fits the religious image of the world in which the Babylonians believed. Babylonian map of the world. The earliest ancient Greek who is said to have constructed a map of the world is Anaximander, who was born in 610 BC in Miletus (now in Turkey), and died in 546 BC. He is said to have studied under Thales but sadly no details of his map have survived. Of course, although only a very limited portion of the Earth was known to these ancient Greeks, the shape of the Earth was always going to be of fundamental importance in world maps. Pythagoras, in the 6th century BC, is believed to be the first to put forward a belief in a spherical Earth while Parmenides certainly argued in favour of this in the following century. Around 350 BC Aristotle put forward six arguments to prove that the Earth was spherical and from that time on scholars generally accepted that indeed it was a sphere. Eratosthenes, around 250 BC, made major contributions to cartography. He measured the circumference of the Earth with great accuracy. He sketched, quite precisely, the route of the Nile to Khartoum, showing the two Ethiopian tributaries. He made another important contribution in using a grid to locate positions of places on the Earth. He was not the first to use such a grid for Dicaearchus, a follower of Aristotle, had devised one about 50 years earlier. Today we use latitude and longitude to determine such coordinates and Eratosthenes' grid was of a similar nature. Note, of course, that the use of such positional grids are an early form of Cartesian geometry. Following Dicaearchus, Eratosthenes chose a line through Rhodes and the Pillars of Hercules (present day Gibraltar) to form one of the principal lines of his grid. This line is, to a quite high degree of accuracy, 36° north and Eratosthenes chose it since it divided the world as he knew it into two fairly equal parts and defined the longest east-west extent known. He chose a defining line for the north-south lines of his grid through Rhodes and drew seven parallel lines to each of his defining lines to form a rectangular grid. Eratosthenes' map of the world. Hipparchus was critical of the grid defined by Eratosthenes, saying reasonably enough that it was chosen arbitrarily. He suggested that a grid should be chosen with astronomical significance so that, for example, points on the same line would all have the same length of longest day. 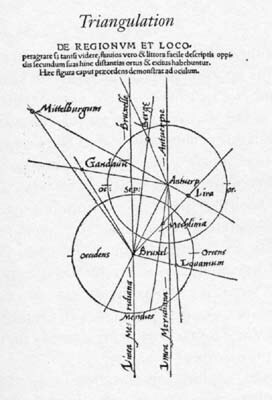 Although Hipparchus never constructed a map as far as we know, he did make astronomical observations to describe eleven parallels given by his astronomical definition. Although no copies of the work by Eratosthenes and Hipparchus survives, we know of it through the Geographical Sketches of Strabo which was completed in about 23 A.D. Although Strabo gives a critical account of earlier contributions to cartography, he devotes only a small discussion to the problem of projecting a sphere onto a plane. He states clearly that his work is not aimed at mathematicians, rather at statesmen who need to know about the customs of the people and the natural resources of the land. ... an imitation through drawing of the entire known part of the world together with the things which are, broadly speaking, connected with it. ... an independent discipline [which] sets out the individual localities. Now the main part of Geography consisted of maps but Ptolemy knew that although a scribe could copy a text fairly accurately, there was little chance that maps could be successfully copied. He therefore ensured that the work contained the data and the information necessary for someone to redraw the maps. He followed previous cartographers in dividing the circle of the equator into 360° and took the equator as the basis for the north-south coordinate system. Thus the line of latitude through Rhodes and the Pillars of Hercules (present day Gibraltar) was 36° and this line divided the world as Ptolemy knew it fairly equally into two. The problem of defining lines of longitude is more difficult. It required the choice of an arbitrary zero but it also required a knowledge of the circumference of the Earth in order to have degrees correspond correctly to distance. Ptolemy chose the Fortune Islands (which we believe are the Canary Islands) as longitude zero since it was the most western point known to him. He then marked off where the lines of longitude crossed the parallel of Rhodes, taking 400 stadia per degree. 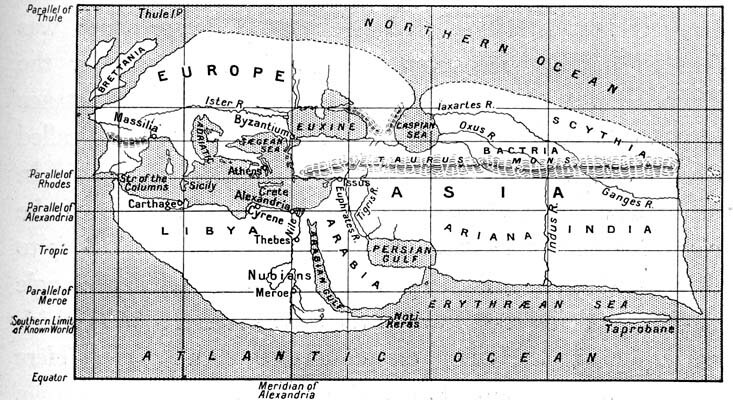 Ptolemy's map of the world. Had Ptolemy taken the value of the circumference of the Earth worked out by Eratosthenes then his coordinates would have been very accurate. However he used the later value computed by Posidonius around 100 BC which, although computed using the correct mathematical theory, is highly inaccurate. Therefore instead of the Mediterranean covering 42° as it should, it covers 62° in Ptolemy's coordinates. Books 2 to 7 of Geography contain the coordinates of about 8000 places, but although he knew the correct mathematical theory to compute such coordinates accurately from astronomical observations, there were only a handful of places for which such information existed. It is not surprising that the maps given by Ptolemy were quite inaccurate in many places for he could not be expected to do more than use the available data and, for anything outside the Roman Empire, this was of very poor quality with even some parts of the Roman Empire severely distorted. Ptolemy used data from most of his predecessors, particularly Marinus of Tyre. He used information from reports of travellers who gave such information as "after ten days travel north we reached ...". In order to estimate distances from such data, Ptolemy had to estimate the difficulty of the terrain, how straight the route the travellers taken had been, and many other unknowns. Given the way that he gathered the data it is certainly not surprising that the maps were inaccurate but they represented a considerable advance on all previous maps and it would be many centuries before more accurate world maps would be drawn. Little progress was made in cartography over the next centuries. That the Romans made few contributions is slightly strange given their skills at road building which required accurate surveying measurements. Also the very precise military strategies which their commanders used would seem to give them the motivation to create maps to help their military campaigns. Perhaps it was the mathematical nature of a map which prevented the non-mathematical Romans from advancing the subject. In China, however, there is evidence that mathematics had been used an a major way in surveying and cartography. In  Liu Hui's 3rd century work the Sea Island mathematical manual is studied. The book gives a good insight into the history of surveying in China and its links with cartography. The main driving force in China to survey and draw maps was often for military reasons but also for problems such as water conservancy. Once Christianity spread across Europe those of learning were Churchmen and the truth about the world, they argued, was contained in the Bible and not to be found by scientific investigation. Where Bible quotations appeared to contradict pre-Christian scientific discoveries, then good science was dismissed as pagan foolishness. Biblical quotations convinced some that the Earth was a circle, certainly not a sphere, while for others quotations such as "the four corners of the Earth" in Isaiah proved that the Earth was rectangular. In the Arabic/Persian/Muslim world, progress was made in cartography, however, and in fact far more progress than was realised for a long time, for it is only in recent years that the full significance of these contributions has been realised. Ptolemy's Geography was translated into Arabic in the 9th century and soon improvements were being made using data obtained from the explorations being carried out. Al-Khwarizmi wrote a major work on cartography which gave the latitudes and longitudes for 2402 localities as a basis for his world map. The book, which was based on Ptolemy's Geography, lists with latitudes and longitudes, cities, mountains, seas, islands, geographical regions, and rivers. The manuscript does include maps which are more accurate than those of Ptolemy, in particular it is clear that where more local knowledge was available to al-Khwarizmi such as in the regions of Islam, Africa and the Far East then his work is considerably more accurate than that of Ptolemy, but for Europe al-Khwarizmi seems on the whole to have used Ptolemy's data. The major work by Sezgin, see , , and , has done much to demonstrate that the medieval Islamic geographers had an important influence on the development of geography in Europe up to 1800. In  he presents a reconstruction of al-Khwarizmi's map of the world which he believes used a stereographic projection of the terrestrial hemisphere, with pole on the terrestrial equator. Sezgin also argues that Ptolemy's Geography may not have included a world map, and that some later world maps are based, at least in part, on Islamic sources. The next important Islamic scholar we should mention is al-Biruni who wrote his Cartography in around 995. In it he discussed map projections due to other scientists, then gives his own interesting mapping of a hemisphere onto a plane. A detailed description of this projection is given in . Al-Biruni wrote a textbook on the general solution of spherical triangles around 1000 then, some time after 1010, he applied these methods on spherical triangles to geographical problems. He introduced techniques to measure the Earth and distances on it using triangulation. He computed very accurate values for the differences in longitude and latitude between Ghazni in Afghanistan and Mecca. He found the radius of the earth to be 6339.6 km, a value not obtained in the West until the 16th century. His Masudic canon contains a table giving the coordinates of six hundred places, some of which were measured by al-Biruni himself, some being taken al-Khwarizmi's work referred to above. At a time when Christian Europe was producing religious representations of the world rather than scientific maps, another type of map, or perhaps more accurately chart, for the use of sailors began to appear. These were called portolan maps (from the Italian word for a sailing manual) and were produced by sailors using a magnetic compass. The earliest examples we know about date from the beginning of the 14th century, and were Italian or Catalan portolan maps. The earliest portolan maps covered the Mediterranean and Black Sea and showed wind directions and such information useful to sailors. The coast lines shown on these maps are by far the most accurate to have been produced up to that time. 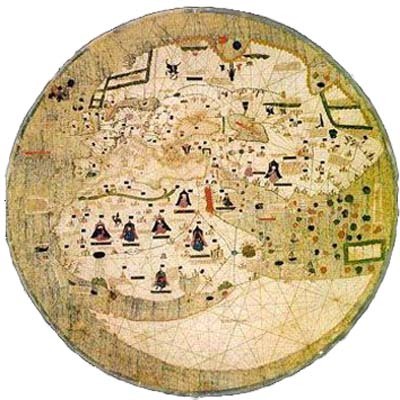 The Catalan World Map produced in 1375 was the work of Abraham Cresques from Palma in Majorca. He was a skilled cartographer and instrument maker and the map was commissioned by Charles V of France. 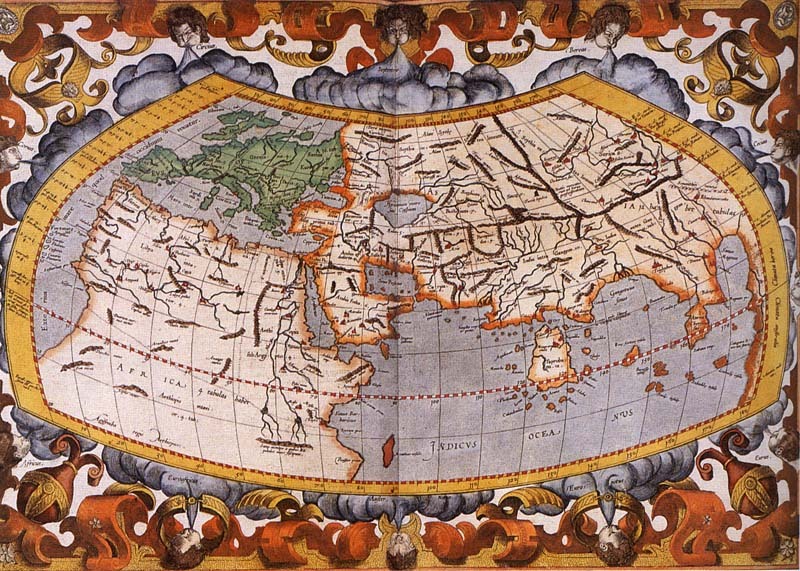 The western part of his map was partly based on portolan maps while the eastern part was based on Ptolemy's data. A 'portolan' map of the North Atlantic. I do not think it derogatory to Ptolemy if I do not follow his 'Cosmografia', because, to have observed his meridians or parallels or degrees, it would be necessary in respect to the setting out of the known parts of this circumference, to leave out many provinces not mentioned by Ptolemy. But principally in latitude, that is from south to north, he has much 'terra incognita', because in his time it was unknown. I have found various opinions regarding this circumference, but it not possible to verify them ... they are not of much authenticity, since they have not been tested. We have confined the Geography of Ptolemy to the first part of the work, in order that its antiquity may remain intact and separate. Since another fourth part [of the world] has been discovered by Americus Vesputius, I do not see why anyone should object to its being called after Americus the discoverer, a man of natural wisdom, Land of Americus or America, since both Europe and Asia have derived their names from women. Waldseemüller also made important contributions to the science of cartography. He wrote on surveying and perspective and produced a booklet on how to use globes. Arabic science continued to flourish, now along side European science, and mathematical geography saw important developments with Sulayman al-Mahri's Tuhfat al-fuhul fi tamhid al-usul and the commentary on it Kitab sarh written in the early sixteenth-century. Al-Mahri used astronomical observations of the height of stars to determine the difference in latitude between two places. Trigonometric methods allowed differences in longitude to be calculated. He also developed a good understanding of how to compensate for the errors caused by short-cuts in his mathematical calculations and also for errors caused by inaccurate data. 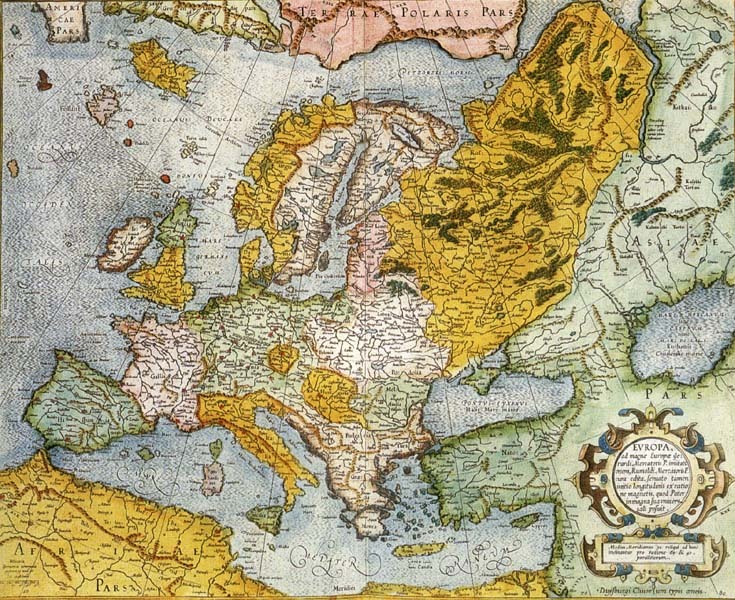 It was the 16th century which saw the first major mathematical improvements in cartography in Europe although Regiomontanus had led the way towards the end of the 15th century. He set up a new press in Nuremburg in 1472 and announced his intention to publish maps and books including Ptolemy's Geography. With an interest in trigonometry, mathematical instruments, astronomy, and geography, Regiomontanus was in a good position to give a lead. He set up a workshop in Nuremburg to make mathematical instruments, and published works giving details of the use of the instruments. He realised that accurate coordinates of places were required to draw accurate maps and that the greatest problem was in computing the longitude. He proposed the method of lunar distances to determine longitude which was an important proposal. Johann Werner was a follower of Regiomontanus from Nuremburg. Werner's most famous work on geography is In Hoc Opere Haec Cotinentur Moua Translatio Primi Libri Geographicae Cl'Ptolomaei Ⓣ written in 1514. This book contains a description of an instrument with an angular scale on a staff from which degrees could be read off. It also gives a method to determine longitude based on eclipses of the Moon and makes a study of map projections. This work by Werner strongly influenced Gerardus Mercator. Albrecht Dürer visited Regiomontanus' workshops in Nuremburg when he was young lad. He was fascinated with the ideas of projecting a sphere and also of what the Earth would look like if viewed from the heavens. He employed his ideas of perspective on maps, and in particular he collaborated with Johann Stabius in the construction of globes in 1515. Apianus, a noted mathematician, began his publishing career with producing a world map Typus orbis universalis Ⓣ which he based on an earlier 1520 world map by Martin Waldseemüller. His 1524 publication Cosmographia seu descriptio totis orbis Ⓣ was a work based largely on Ptolemy which provided an introduction to astronomy, geography, cartography, surveying, navigation, weather and climate, the shape of the earth, map projections, and mathematical instruments. 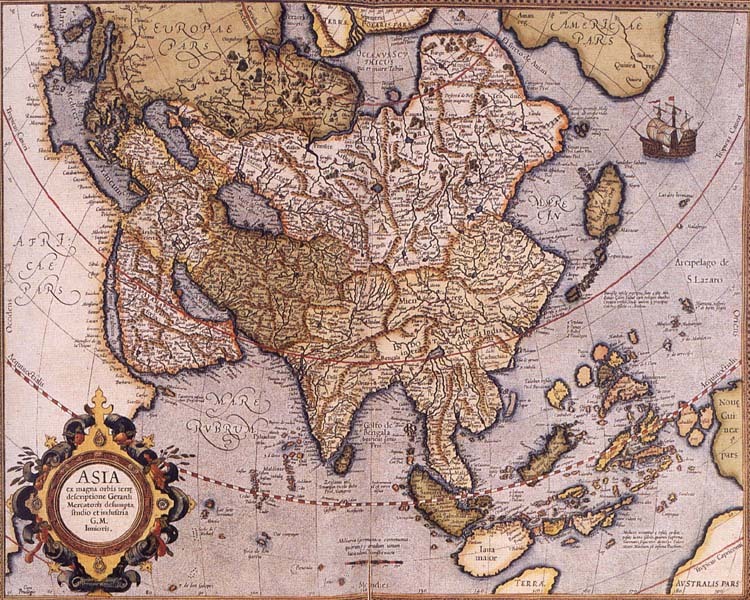 Gemma Frisius was another mathematician who made significant contributions to cartography. He produced his own version of Apianus's Cosmographia a few years after the original edition. In 1530 he published On the Principles of Astronomy and Cosmography, with Instruction for the Use of Globes, and Information on the World and on Islands and Other Places Recently Discovered which made major contributions to cartography. In particular he described how longitude could be calculated using a clock to determine the difference in local and absolute times, being the first to make such a proposal. In 1533 Gemma Frisius published Libellus de locurum Ⓣ which described the theory of trigonometric surveying and in particular contains the first proposal to use triangulation as a method of accurately locating places. This provided an accurate means of surveying using relatively few observations. Positions of places were fixed as the point of intersection of two lines and, as Frisius pointed out, only one accurate measurement of actual distance was required to fix the scale. Not only did Frisius propose an efficient theoretical method for surveying which was needed to produce accurate maps, but he also produced the instruments with which to undertake the surveys and he published accurate maps using the data gathered from such surveys. An example of Gemma Frisius's triangulation. Following Gemma Frisius, major contributions were made by Gerardus Mercator who studied under Frisius. Mercator made many new maps and globes, but his greatest contribution to cartography must be the Mercator projection. He realised that sailors incorrectly assumed that following a particular compass course would have them travel in a straight line. A ship sailing towards the same point of the compass would follow a curve called a loxodrome (also called a rhumb line or spherical helix), a curve which Pedro Nunes, a mathematician greatly admired by Mercator, had studied shortly before. 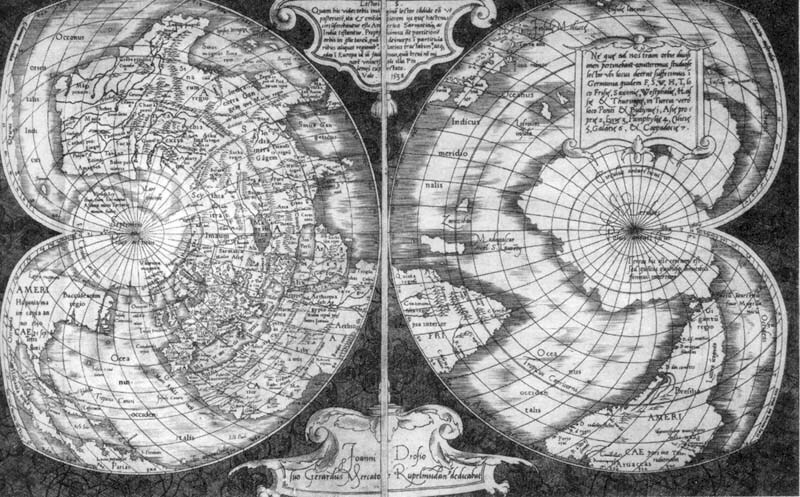 A new globe which Gerardus Mercator produced in 1541 was the first to have rhumb lines shown on it. This work was an important stage in his developing the idea of the Mercator projection which he first used in 1569 for a wall map of the world on 18 separate sheets. The 'Mercator projection' has the property that lines of longitude, lines of latitude and rhomb lines all appear as straight lines on the map. In this projection the meridians are vertical and parallels having increased spacing in proportion to the secant of the latitude. Edward Wright published mathematical tables to be used in calculating Mercator's projection in 1599, see  for details. 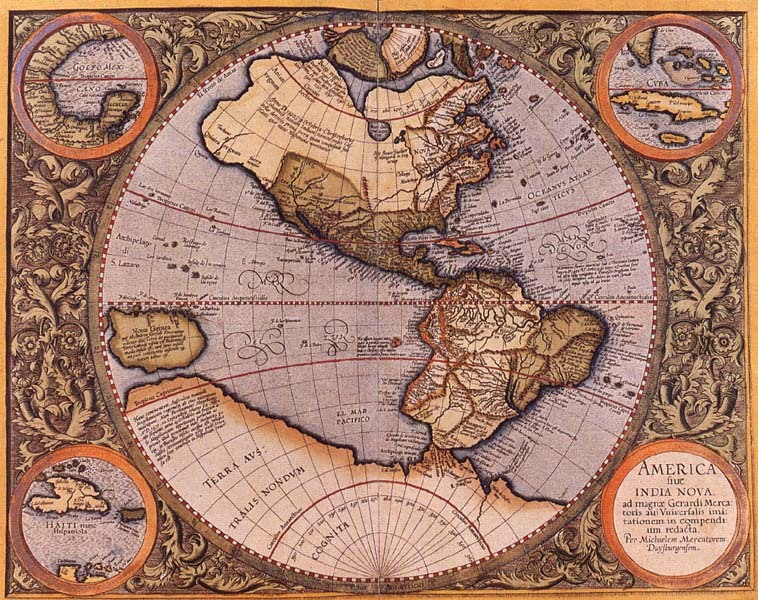 Mercator's map of the Americas. then his formula allowed one to find the other two. It is interesting to realise that on a map of the world drawn with the Mercator projection, Greenland (whose area is about 2 million km2) appears to be larger than Africa (whose area is about 30 million km2). As a world map the Mercator projection then has considerable disadvantages (as necessarily do all projections) but for sea charts it is undoubtedly the best projection and was eventually adopted by all sailors. Abraham Ortel, known by his Latinised name of Ortelius, was born in Antwerp on 4 April 1527. He studied Greek, Latin and mathematics and, strongly influenced by Gerardus Mercator, went on to open a map making business. He published the Theatrum orbis terrarum Ⓣ in 1570 which consisted of 70 maps presented in a uniform style using the most up-to-date data. It was the most popular atlas of its time, and it is important in the history of cartography partly because Ortelius quotes 87 authorities for the data on which his maps are based. It appeared a few years before the atlas of Mercator began publication and many argue that Mercator delayed in order to let his younger friend have priority. This, however, seems unlikely and it is much more probable that Mercator's work was delayed, for by the 1570s he was an old man with health problems. I do not doubt but that it would be of very good use to have natural maps of the Earth . . . as well as civil. . . . Our common maps I call civil, which note the distinction of countries and of cities, and represent the artificial Earth as inhabited and cultivated: But natural maps leave out all that, and represent the Earth as it would be if there were not an Inhabitant upon it, nor ever had been - the skeleton of the Earth, as I may so say, with the site of all its parts. Methinks also a Prince should have such a draught of his country and dominions, to see how the ground lies in the several parts of them, which highest, which lowest; what respect they have to one another, and to the sea; how the rivers flow, and why; how the mountains lie, how heaths, and how the marches. Such a map or survey would be useful both in time of war and peace, and many good observations might be made by it, not only as to natural history and philosophy, but also in order to the perfect improvement of a country. Progress in cartography now became dependent on having the means of accurately determining the position of places in the world. Calculating latitude was easy, and had long been achieved with a sextant, but the problem of accurately calculating the longitude proved a great challenge. The story of attempts at solving this problem are given in our two essays Longitude and the Académie Royale and English attack on the Longitude Problem and it is to these essays that we refer the reader for information on many later developments in cartography. The Low Countries had dominated developments in cartography through the 16th and early 17th centuries. However after this the centre of activity moved to France where a national survey based on a mathematical approach to trigonometric surveying led the way. There is another problem with longitude, other than methods to calculate it, namely that a zero needs to be set arbitrarily. At first, as is to be expected, several different places were chosen as the zero such as Paris, Cadiz, Naples, Pulkova, Stockholm and London. International agreement was needed to set cartographic standards and the International Meridian Conference held in Washington D.C. USA in 1884 had delegates from 26 countries. They standardised the Greenwich Meridian as the zero for longitude and, after some delay, all countries adopted this and the equator as the basic reference lines. There is, of course, another decision to be taken in order to standardise maps, namely how the map is oriented. It is fairly logical to have either north or south at the top, but which is chosen is a completely arbitrary decision. Early Christian maps had north at the top while early Arabic/Muslim maps had south at the top. Without any international agreement, it has become standard practice to have north at the top of a map. Other collaborative international projects have been less successful. In 1891 there was an International Geographical Congress in Bern which established the International Map of the World. Standards were set and a symbol convention was chosen. The scale was to be 1:1000000 and several nations agreed to cooperate to produce a world map to this standard. Some, but not all, of the proposed maps have been produced but the project has never been completed.